How can you measure and evaluate auditory perception? How can you rehabilitate or improve auditory perception? The phone rings, and when you answer it, you hear your mom on the other side asking how you are. You're able to quickly and easily decipher what she's saying, recognize her voice, and hear her emotional state in just the first few moments of the call. However, this seemingly simple task is actually very complex and requires the use of a number of brain areas that specialize in auditory perception and the recognition of its sub-components. Receive Information: When an object vibrates, which is the case of human voice (vocal chords vibrate), the waves produced by this action are transmitted by the air or other means. When these waves reach the inner ear, certain cells are activated. Information Transmission: The cells produce a signal that are transmitted through different nuclei until it finally reaches the medial geniculate nucleus in the thalamus. Information Manipulation: Finally, the auditory information received by the ear is sent to the auditory cortex in the temporal lobes. The information is manipulated and sent to the rest of the brain to allow you to interact with it. Intensity: Refers to if the volume is high or low. Timbre: Allows us to distinguish and recognize voices, instruments, or sounds. They are usually identified as the "color" of sound. Auditory perception is a multi-step processes. Detection: The most basic part of being able to perceive an auditory stimulus is that it has enough intensity to reach our ears. It is also necessary for the sound to be within an audible range. If it meets these two requirements, the brain is able to detect where the object is that is producing the vibration, and even tell if it is moving. If someone speaks too quietly, we aren't able to hear them. Discrimination: In order to perceive and appreciate a sound, we have to be able to differentiate the sound from other background noise. If you are at a restaurant or party where there is a lot of noise, you may not be able to hear what the speaker is saying. Identification and recognition: We have to be able to identify where the sound is coming from as a voice, instruments, or any other sound. This includes recognizing our personal relation to the sound (for example, "it's my friend's voice"). In order to perceive a voice, we need to be able to identify it as such and not confuse it with another sound, as well as identify the voice as that of a friend and not a stranger. Logically, auditory perception plays a very important role in our day-to-day lives, being present in almost every task we perform. It allows is to properly interact with our environment, communicate fluidly, alert us of any potential threats around us, and makes it possible to enjoy music. Starting from the moment your first class begins in Kindergarten to your last class of college, good auditory perception is a necessary part of academics, as it allows you to follow along and understand what the teacher is saying. Poor auditory perception without extra help, either with visuals or other resources, may cause comprehension problems when attending to a conversation or reading, causing poor performance in school. Whether it meet at meetings or conversations, most jobs require the constant use of auditory perception. Fluid communication is the basis of working with customers, which is why auditory perception is important for an efficient professional development. Auditory perception is a key part of safe driving. In dangerous situations, the sound of another car's horn can help keep you focus and alert you that something is wrong. Also, listening to the sound of the car and motor will tell you if there is anything wrong with the car and if you need to have it looked at. For music, auditory perception is everything. If you want to play a song on the guitar or piano and have it sounds nice, you have to really put your auditory perception to the test and pay attention to every note. Listening to and perceiving music also generally requires auditory perception (although it is also possible to feel the vibrations and perceive it that way). Detecting, identifying, recognizing, and understanding the sounds around you makes it possible to appropriately fit in to your environment. It doesn't only allow you to adapt on the street or at home, but as we're social animals, it also allows us to communicate with others more easily and efficiently. An alteration in auditory perception may be due to a variety of problems of different levels. The inability to perceive sounds, or some kind of deficiency in this process is called deafness. This may be caused by damage to the receptive organs or in the pathways that bring information to the brain (hypoacusis and hyperacusis), or brain areas dedicated to heating (cortical deafness). However, perception does not work on its own. Specific damage, like stroke or brain injury, may alter each of the specific process mentioned above. These types of disorders are caused by damage to the specific parts of the brain that are in charge of the altered processes. Wernicke's aphasia refers to the inability to understand language (the patient will feel like they are hearing an unknown language). However, auditory agnosia is the inability to recognize a heard object, meaning that they will not recognize when someone refers to an object verbally. It may also cause an inability to perceive and appreciate music, which is known as amusia (unable to recognize or reproduce tones or musical rhythms). In some cases, it's possible that the damage is more specific, losing only the ability to locate or imitate sounds. Aside from the disorders that cause an impaired hearing, there are some disorders that cause the person to hear sounds that are not there. The most common of these disorders is tinnitus, which causes the person to hear a constant ringing. In other cases, the problem causes the brain to erroneously activate the auditory cortex, leading to hallucinations. This may occur in disorders like schizophrenia, where the hallucinations may be threatening. Other cases include musical hallucinations, where the person hears music as if it were coming from the radio, but isn't able to turn it off. In the case of paracusis of Willis, the auditory hallucinations are accompanies by weakened hearing. 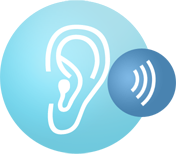 Auditory perception allows us to do many daily activities effectively and quickly. Our ability to comfortably fit into our environment is closely related to auditory perception, which is why understanding how well one's auditory perception is can be of great help in a variety of different areas. For example, in the academic field, to know if a child needs visual help or support in class, or if potential learning difficulties stem from poor auditory perception, in medical areas, to know if a patient fully understands their medication and is able to properly fit into their environment, and in a professional setting, so that an employee may be able to communicate well within a company when working with the public. With the help of a complete neuropsychological assessment, it is possible to efficiently and reliably assess a number of fundamental cognitive functions, like auditory perception. The tests that CogniFit uses to evaluate auditory perception were inspired by the classic NEPSY test from Korkman, Kirk, and Kemp (1998), the Test of Memory Malingering (TOMM), and the Test of Variables of Attention (TOVA). Aside from auditory memory, the tests also measure naming, reaction time, processing speed, contextual memory, working memory, cognitive flexibility, visual memory, visual perception, and recognition. Identification Test COM-NAM: Objects are presented as an image or with sound. The user will have to identify if the object was presented as an image, as a spoken word, or if it was not previously presented. Inquiry Test REST-COM: A series of images will be displayed for a short period of time. After, the usr must choose the words that correspond to the images as quickly as possible. Every cognitive ability, including auditory perception, can be trained and improved, and CogniFit has created professional tools to make that possible. Brain plasticity is the basis of auditory perception rehabilitation and other cognitive skills. CogniFit has a battery of clinical exercises designed to help rehabilitate the deficits in auditory perception and other cognitive functions. The brain and neural connections can be strengthened by challenging and working them, so by frequently training these skills, the brain structures related to auditory perception will become stronger. This means that when your ears send information to the brain and the brain processes it, the connections will work faster and more efficiently, improving overall your auditory perception. CogniFit has a team of specialists who research synaptic plasticity and neurogenesis processes, which has allowed for the creation of the personalized cognitive stimulation program to train each user individually. This program starts with a precise evaluation of auditory perception and other fundamental cognitive functions. The program then takes the results from the assessment and creates a personalized program that helps train the user's weakest skills. The key to improving auditory perception is adequate and consistent training. CogniFit has professional assessment and training tools to help both individuals and professionals optimize this function. It only takes 15 minutes a day, two to three times a week. The personalized cognitive stimulation program from CogniFit is available online. There is a wide variety of interactive activities and brain games that can be played on a computer or mobile device. After each session, CogniFit will provide a detailed graph of the user's cognitive progress.